Its morning and I am well just plain tired. I need some breakfast… I have the urge for being perched somewhere scenic sipping a beautiful coffee … away from the stress of everyday life! That’s what’s required…. so where should I go? Thankfully I met someone recently who told me that the Bird & Bear (review here) which closed this year has been re-opened by the Miss Chu group. They do breakfast until 11am and then the Miss Chu Vietnamese Tuckshop style food for the rest of the day. 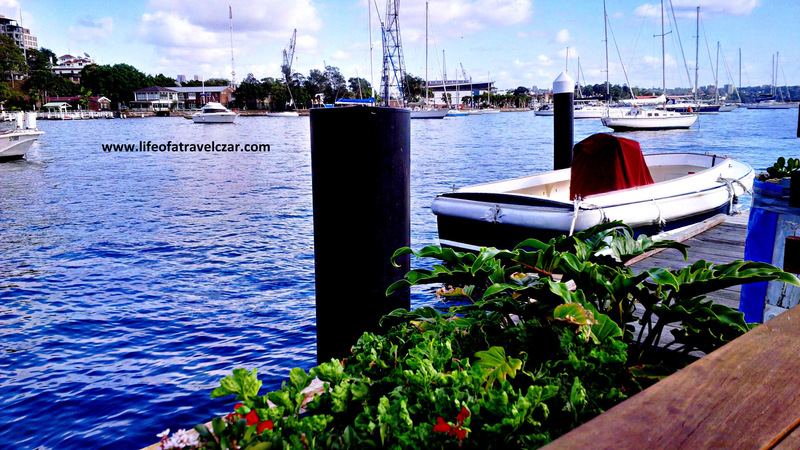 I get there nice and early and this is the view from the Marina – probably the most beautiful breakfast spot in Sydney! The drip of espresso and milk form a little dance on my tongue as the caffeine hit from the bitter espresso wakes me up and helps me appreciate the smile of the wonderful waitress. The breeze flows through making the warm coffee a welcome escape from the morning chill which is still present in summer. Its a beautiful moment. The doughy plush, ricotta hotcakes are such a treat. The creaminess of the ricotta is discernible and the crisp crust of the outside of cakes that have borne the brunt of the pan’s heat shines through. The hotcakes are combined with the sweet, sticky, smoky and earthy flavour of the maple syrup which has a little sprinkling of salt for that ying/yang touch. The caramelised sugar clings to the banana to provide a smoky sweet sensation. The soft banana pairs wonderfully with the hotcakes and that little dusting of icing sugar – probably doesn’t add too much to the dish…. but hey it looks beautiful. I know I focus on food – but I seriously can’t think of a better backdrop for those Ricotta Hotcakes (picture below)! 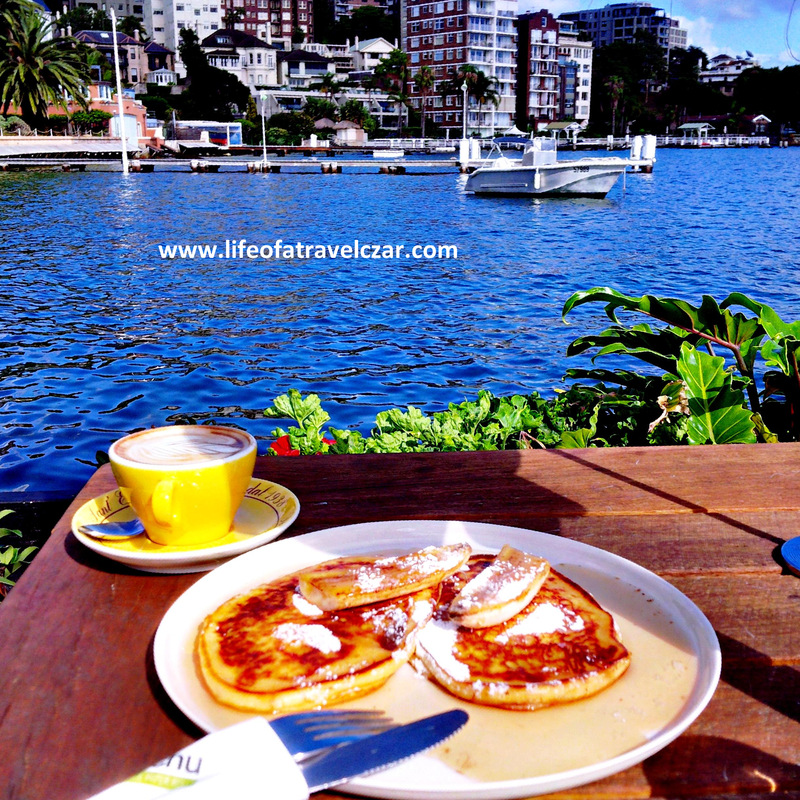 Each sip of coffee and each bite of the hotcake probably takes a minute, but its seems timeless with this view… I cast an idyllic gaze across the still waters of Elizabeth Bay, the beautiful boats, the Palm Trees, the flowers on the marina and beautiful wooden planks which support the Marina and I am just breathless. Love all your posts, amazing! Isn’t it tiring travelling so much? Isn’t it lonely travelling by yourself?